Graduate of the University of Michigan and DePaul Law School (Member, DePaul Law Review, 1981-82). Private practice attorney assisting people who have all types of bodily injuries from automobile accidents including fractures, scars, paralysis, traumatic brain injuries and death. Multiple million dollar verdicts and settlements for all types of injuries. Has worked with the Michigan Brain Injury Association since 1984 and has served in the capacities as Grand Rapids Chapter President, Vice President, and Delegate to the State Board. This experience has provided background in head injuries and a working knowledge of the goals established by the Brain Injury Association. Mr. Thieme focuses his legal practice on representing people injured in automobile and personal injury accidents. He is the president of R. Kevin Thieme, P.C. He is a graduate of the University of Michigan and DePaul Law School (Member, DePaul Law Review, 1981-82; Author: "Worker's Compensation and the Dual Capacity Doctrine). Mr. Thieme was admitted to the bar in 1982. 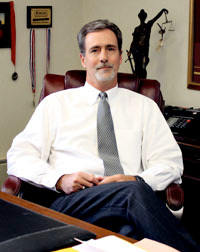 Mr. Thieme is an active member of the Grand Rapids Bar Association, State Bar of Michigan, Michigan Association for Justice, and The Association of Trial Lawyers of America with practice in both State and Federal Court, including the U.S. Court of Appeals, Sixth Circuit, U.S. District Court, and the Michigan Supreme Court. He was extensively involved in rewriting the Michigan Head Injury State By-laws. Mr. Thieme has been a faculty member (and faculty demonstrator) at the Hillman Advocacy Program (Grand Rapids - 1/99, and 1/00). He was a presenter at the 1999 Michigan State Bar Conference (closed head injuries), he presented "Understanding the Basic Issues of Michigan's No-Fault System" at the Traumatic Brain Injury Rehabilitation Conference (Holland - 10/99), presented a Legal Issues Workshop for the Traumatic Brain Injury Rehabilitation Conference (Holland - 10/5/98), he has been a guest lecturer on Product Liability at Grand Valley State University, and spoken at numerous seminars including "Automobile No-Fault Law (Grand Rapids - 6/20/96), "Automobile No-Fault Update" (Grand Rapids, Grand Rapids Bar Association - 4/30/96), "Cross-Examination: The Medical Expert" (Grand Rapids - 11/9/95), "Ethics & Economics, Wants and Wishes versus Needs" (Grand Rapids, Mary Free Bed Hospital - 9/22/95), "Establishing a Successful Law Practice" (Grand Rapids - 1/17/95), "No-Fault Benefits and Health Care Workers" How to Document Needs (Grand Rapids, Health Care Associates - 5/27/94), "No-Fault Benefits for Catastrophically Injured Clients" (Grand Rapids, Rehabilitation Insurance Nurse Council - 3/3/93). Advanced Seminar for Motor Carriers and Their Insurance Carriers (Grand Rapids - 9/05). Presenter: “Do Vocational Training Options Exist Under the No-Fault Act for Adolescents Injured in Motor Vehicle Accidents?” (Grand Rapids, Mary Free Bed Hospital - 5/30/08). Since 1999, Mr. Thieme has served as a Hearing Panelist on the Michigan Attorney Discipline Board. Mr. Thieme is also a Certified Brain Injury Specialist.